Alun Griffiths is a leading regional civil engineering and construction contractor. The company operates from several locations and is experienced in both the public and private sectors. The company’s services include major and minor capital projects, maintenance contracts, partnering and joint ventures. 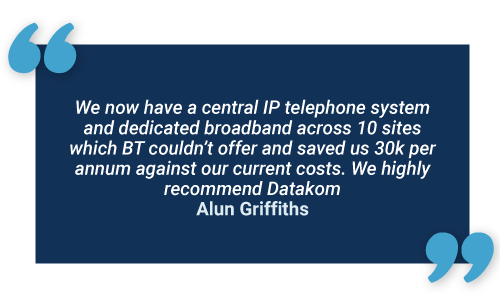 Alun Griffiths needed an established company to provide them with all their communications across the sites, while remaining within its existing budget. The business also needed dedicated broadband at all sites, to ensure downtime was minimised and productivity increased. The equipment currently in place was outdated, lacking key features and was unable to transfer calls between sites due to the lack of a central system. To work more efficiently, one telephone system was needed, connecting all sites. This would enable both site-to-site calls and lower costs. Alun Griffiths also lacked reliable support and assurance that its telecom services were being properly maintained. With the former telecom supplier, monthly costs continued to increase, and temporary sites required internet immediately. Alun Griffiths contacted our team at DataKom to help them with these problems. All sites connected using one phone system. A private internet connection reserved solely for one premise. meaning no competing for bandwidth. In the event of a fault, the backup will take over the phone system. Calls are no longer costing the business money when transferring internal calls. Award-winning call management tool. Delivers call reports which give insight into peak hours, the number of answered and missed calls, customer engagement and fraud detection. This number offers a nationwide presence, so the business positions itself as open to new customers and opportunities. E.g. 0800.